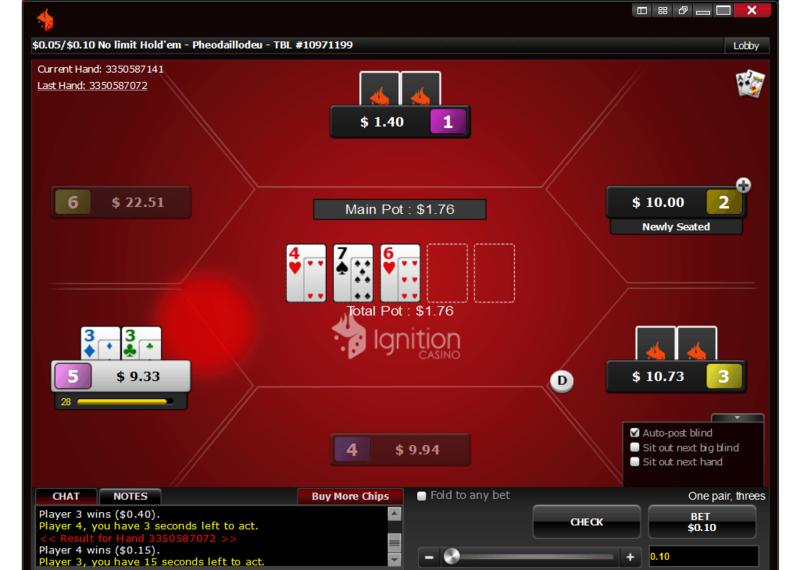 Ignition Poker offers a $1,000 bonus for all new players. Their VIP Program, Ignition Rewards, allows players to earn even more. The Ignition Poker bonus is automatically given to all players making their first deposit. This means there is no Ignition Poker bonus code that must be entered. Make sure to deposit $1,000 or more to earn the full $1,000 bonus offered. Note: Even though you want to claim the poker bonus, you still need to select “Ignition Casino Welcome Bonus” from the drop down menu. This is because Ignition bundles its poker and casino bonus together. 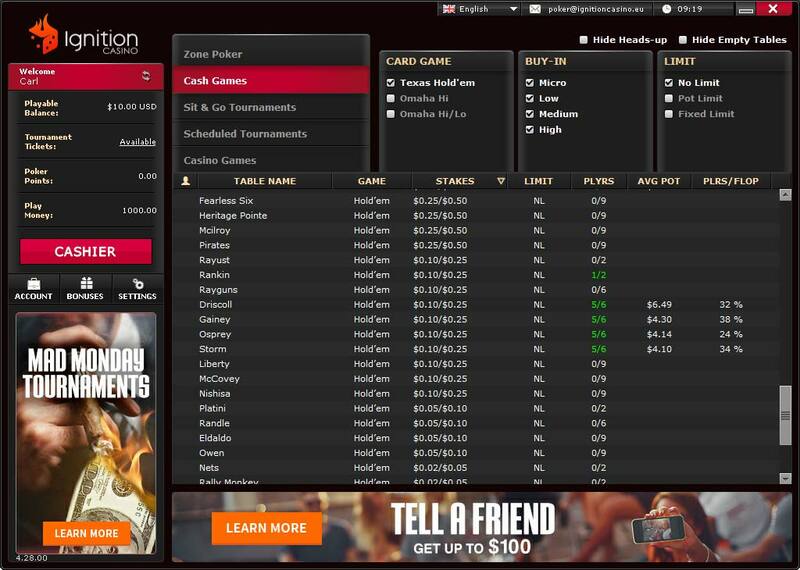 The full bonus offered by Ignition for poker players is 100% up to $1,000. This means a $1,000 or larger deposit will earn all first depositing players a $1,000 bonus. As with most other online poker bonuses, the funds will not become available immediately and must be earned or cleared before they become cash. This is explained in the next section. Collect 15 Poker Points, receive $5 of the bonus. Collect 85 Poker Points, receive $20 of the bonus. Collect 185 Poker Points, receive $25 of the bonus. Collect 400 Poker Points, receive $50 of the bonus. Collect 1,000 Poker Points, receive $100 of the bonus. Collect 2,500 Poker Points, receive $200 of the bonus. Collect 5,000 Poker Points, receive $250 of the bonus. Collect 10,000 Poker Points, receive $350 of the bonus. These values for points represent total points accumulated, not extra points needed for each portion. 10,000 points is sufficient to clear the entire $1,000 bonus. 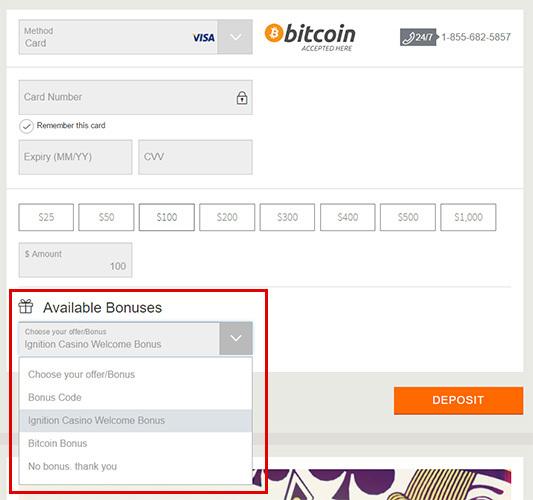 This bonus has an expiration of 30 days, which means the full amount must be earned within 30 days or an unearned balance will become invalid. Players also earn 3 points for every $1 in tournament fees paid. In other words, if a player were to join a $30 + $3 tournament, they would collect 9 points for that event. If at a cash table, a player contributed $1.50 in rake, they would collect 1 point. $1,000 is among the largest bonuses you will find online today, and it clears reasonably quickly. Using tournaments as an example, a player must pay a total of $3,334 in fees to earn the full $1,000. This means the bonus is worth ~33%, meaning you will get 33% of rake you pay back once you clear the bonus. Although 33% isn’t the best clearance rate for poker bonuses, it is noticeably above the industry standard, meaning you’ll get a good return on your rate. Note that at the lower tiers, you’ll actually be getting back substantially more than 33%, and this percentage tapers down towards 33% once you reach the end of the bonus.